As tradition we headed to Scotland for a week during the Easter holidays. First stop was Sunnyside Croft Campsite just outside Arisaig. This was a relatively new site but had everything you could wish for; friendly hosts, fantastic views and direct access to the beach to launch the sea kayak. The weather was not being kind to us for the start of the trip and was mixed throughout. This meant making the most of the calm weather when it came! We decided to head towards Arisaig Skerries. The wind was set to pick up to a 6 later in the day so we had to be quick out and back if we were going to go. We launched from the campsite and made our way around the headland which was quite choppy all the way, hence why not many photos! In the shelter of the skerries we explored between the islands and seal spotted before heading back. The wind had already started to pick up and it was getting a little too rough so we decided to take a portage as to avoid going around the headland. Once back in the shelter of the bay and the campsite we breathed a sigh of relief. The weather really was not going to give us a break this trip so it was a case of battening down the hatches! We decided to make our way to the Isle of Skye and Glen Brittle. We caught the calmac from Mallaig and headed for the campsite on Loch Brittle. Although the facilities were basic this campsite was awesome and a great place to come and get away from it all! Not one to sit still we decided to go for a run to the headland and try and spot the viking canal. The plan was to sea kayak out to Soay so this was a good way of exploring the route! The run was undulating and although we had spotted the numerous burns along the trail we were not prepared for the continuous wading that had to be done! A couple of hours and we were back at the campsite warming our feet with a well earned cuppa before braving the showers! The weather once again was not being kind but we decided to take a ride over the Bealach Brittle and explore Glen Brittle forest. The ride started with the road up the glen. Taking a left took you into the forest and the climbing started over the Bealach Brittle. The views in every direction were stunning! The riding was pleasant all the way over to the shores of Loch Eynort. Forest road all the way but with stunning views. We had spotted a forested steep trail whilst climbing the Bealach which we all decided was worth the climb back up on the way back. This dropped us onto the forest road once again and onto singletrack back to just below Glen Brittle house using a swingbridge to cross the river. Not our usual type of riding but this was well worth the effort for the stunning views! Once again the weather was very mixed and the forecast unsettled. We decided to venture out into Loch Brittle and make the decision as to how far we go once out there. Launching from the campsite is always a great feeling! The views were stunning from the middle of the Loch with the Cuillins imposing in the background. We paddled out to the end of the Loch and the water was getting messier and rougher the further we ventured. 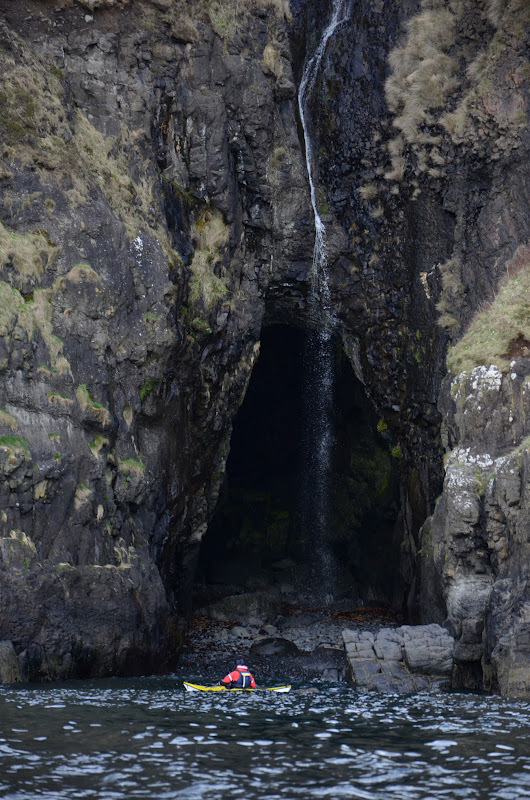 We all agreed that it was not a good idea to continue so we headed for the opposite side of the Loch to check out some of the caves and waterfalls. We headed back in admitting that the weather was not set to get better so we should head inland to Glen Nevis and Fort William. The last adventure of the trip took us to Laggan Lochs for a ride around Glengarry Forest. The route was straight out of the vertebrae Scottish Mountain bike guide. As we have had so many great rides from the book we were very surprised when this turned out to be a nightmare! We headed from Laggan Lochs to start the 32km ride. What we ended up with was a 5 mile push in the middle of the route with thunder, lightening and hail! The start was lovely apart from the condemned bridge which we had to brave praying that it was not going to collapse! We soon arrived at Laddie hut that dates back to the 1800's and the trail soon turned to singletrack. Stunning views opened up and it soon felt like you were in the wilds of Scotland! The book gives a description of traversing the lower slopes of Meall a'Choire Ghlais but after a very boggy ride for the first 2 km the route became totally unrideable. Once out of the forest there was no distinct track so it was a 5 miles trek over open scottish moorland! To make matters worse we had hail and thunder storms and even snow as we got to the top of Cam Bealach. There were a few sense of humour failures at this point! Once at the top of the Cam Bealach the trail was a technical singletrack descent to the loch shore. Taking a left at the bottom took us back to Laggan Lochs and the warmth of the motorhome. Soup and tea never tasted so good! This was one ride that will haunt us forever, very close to hypothermia and loss of feeling in the feet from walking in snow and icy cold bog! Nevertheless still a great adventure! It was soon time to head home. We always believe you can tell how beautiful a place is when you are in awe of the views even in bad weather! There were many of these moments during this trip!